Excitement was in the air as Watauga Medical Center staff gathered around the loading dock in hopes of witnessing history. At last, the long-awaited day had come, “it” was here. 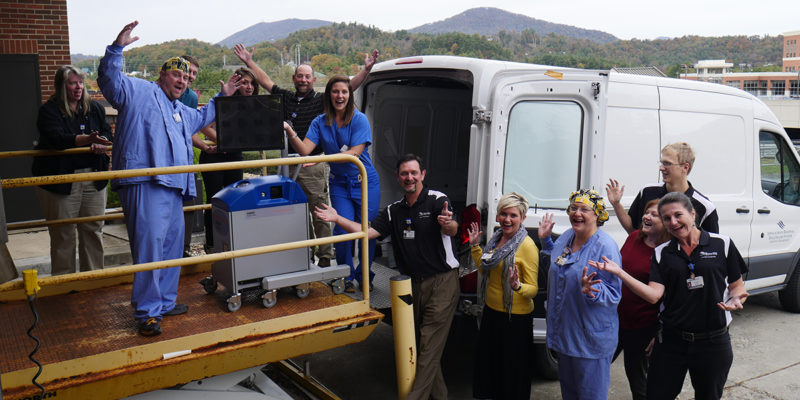 The crowd cheered as a medical transport truck unloaded a new high-tech piece of equipment, the first robot-assisted surgery system in the High Country. Moments later the machine was ushered into the materials management department where it was quickly assembled and brought to life for the first time. As with all new medical equipment, the robot was then carefully inspected before it was transported to its new home in the operating room. 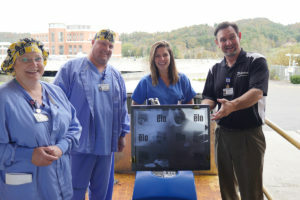 This new cutting-edge robot is the latest example of Appalachian Regional Healthcare System’s unwavering commitment to provide the best in advanced surgery technology right here in the High Country. The surgeon uses the robot in the operating room to create a 3D model of the patient’s cartilage and bonethrough direct surface mapping. Direct surface mapping saves the patient time, money and unnecessary exposure to radiation by eliminating the need for a conventional preoperative CT scan. The surgeon then uses the 3D model to virtually simulate the knee replacement on the robot’s large screen monitor before starting the actual procedure.The surgeon then uses the handheld robot’s burring technology to accurately assist in bone removal and preparation. From there, the robot is used to help implant the knee replacement device. This entire process is displayed on the monitor in real-time, allowing the surgeon to continually assess the patient’s anatomy against the simulated operative plan. Some patients will benefit from the JOURNEY™ II XR (bi-cruciate retaining total knee system implant) which is one of the only total knee designs allowing retention of the ACL, and is designed to improve patient satisfaction.10 Determining which implant option is best for the patient is a patient-specific decision made with guidance from the surgeon. Most knee replacement patients require a brief inpatient stay at the hospital. To better care for these patients, Watauga Medical Center recently opened a new 10-bed orthopedic wing on the third floor of the hospital. Designed with the patient in mind, the new wing serves as a safe environment for patients to recover and to start the rehabilitation process. The wing is staffed by a dedicated team of specialty trained nurses, physical and occupational therapists and medical providers from AppOrtho. The first robot-assisted knee replacement surgery at Watauga Medical Center is scheduled for later this week. Not every patient is a good candidate for a robot-assisted knee replacement surgery. At AppOrtho, each patient is carefully evaluated in order to determine the most appropriate treatment option. All non-surgical treatment options are considered before surgery is recommended.To make an appointment at AppOrtho, call 828-386-2663 or request an appointment here. No referral is required. Pastides P, Nathwani D. The role of newer technologies in knee arthroplasty. Orthopaedics and Trauma (2016). http://dx.doi.org/10.1016/j.mporth.2016.10.003. 2. Banerjee S, Cherian JJ, Elmallah RK, Jauregui JJ, Pierce TP, Mont MA. Robotic-assisted knee arthroplasty. Expert review of medical devices. 2015;12(6):727-735. 3. Urish KL, Conditt M, Roche M, Rubash HE. Robotic Total Knee Arthroplasty: Surgical Assistant for a Customized Normal Kinematic Knee. Orthopedics. Sep 01 2016;39(5):e822-827. 4. Nodzo SR, Carroll KM, Mayman DJ. Disposable Navigation for Total Knee Arthroplasty. Am J Orthop (Belle Mead NJ). May-Jun 2016;45(4):240-245. 5. Abdel MP, Oussedik S, Parratte S, Lustig S, Haddad FS. Coronal alignment in total knee replacement: historical review, contemporary analysis, and future direction. The bone & joint journal. Jul 2014;96-b(7):857-862.6. Centers for Medicare & Medicare Services. <https://www.cms.gov/medicare/medicare-fee-for-service-payment/acuteinpatientpps/readmissions-reduction-program.html. Accessed 06/01/17>. 7. Sharkey, P., et al. “Why Are Total Knee Arthroplasties Failing Today?” Clinical Orthopaedics and Related Research. 2002 Nov;404:7-13. 8. Siddique, N., Ahmad, Z. “Revision of Unicondylar to Total Knee Arthroplasty: A Systematic Review” The Open Orthopaedics Journal 2012;6; (Suppl 2: M2) 268-275. 9. Sg2 Healthcare Intelligence. Technology Guide: Orthopedic Surgical Robotics. 2014. 10. Moro-Oka, Taka-Aki, Marc Muenchinger, Jean Pierre Canciani, and Scott A. Banks.“Comparing in Vivo Kinematics of Anterior Cruciate-retaining and Posterior Cruciate-retaining Total Knee Arthroplasty.” Knee Surgery, Sports Traumatology, Arthroscopy 15.1 (200&): 93:99. Web. 11. B. Kayani, S. Konan, J. Tahmassebi, J. R. T. Pietrzak and F. S. Haddad. Robotic-arm assisted total knee arthroplasty is associated with improved early functional recovery and reduced time to hospital discharge compared with conventional jig-based total knee arthroplasty. 12. The Bone & Joint Journal 100-B (7): 930-937. 2018. Increased precision of coronal plane outcomes in robotic-assisted total knee arthroplasty: A systematic review and meta-analysis. Surgeon 16 (4): 237-244. 2018.